Densely populated with beer-swilling denizens, El Cajon might be equally stocked with craft-beer spots. Alas, it’s a virtual wasteland of macrobrew dives — with this single sterling exception. 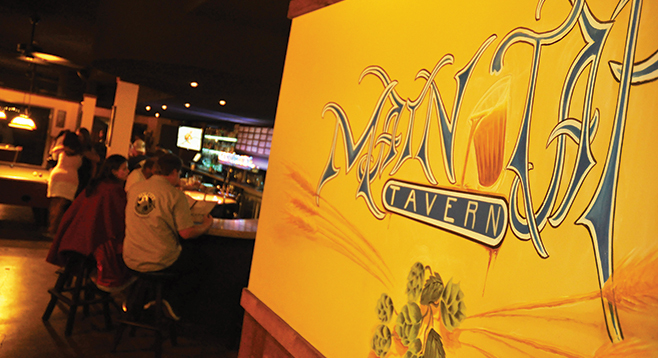 Equipped with 24 taps — most devoted to local liquid refreshment, but all siphoning out fine craft beer — Main Tap has swung for the fences. Sunday 3-6pm: $3 Bloody Marys and mimosas. Monday 3-6pm: $6 lunch specials. Tuesday 3-6pm: $4.50 appetizers. $2.50 fish tacos. Friday 3-6pm: $4.50 appetizers. All day $4 shots. Saturday 3-6pm: $5 meatball sandwich. Jan. 28, 2009 @ 3:06 p.m. Without a doubt, the ONLY place in El Cajon that you need to go. They remodled and it looks great, the staff is friendly, food is delish, they have a HUGE beer selection. Love the patio too!